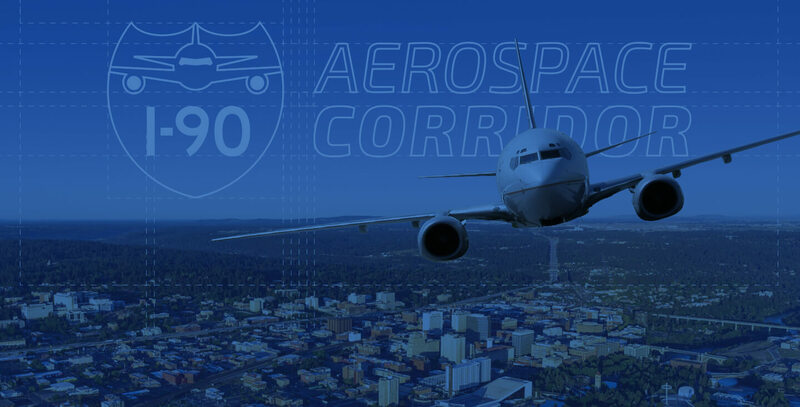 The I-90 Aerospace Corridor—a network of organizations whose mission is to promote the aerospace industry and drive expansion of the supply chain along Interstate 90 from central Washington through northern Idaho to central Montana—was in it’s infancy when it engaged PMG to create a logo system, brand guidelines, graphics and brochures. Logo and brand development, brand guidelines, research and content curation, as well as brochure collateral. Designed multiple logo options with the chosen concept using the silhouette of a plane inside the shape of an interstate symbol. The wingspan is in the location of the dividing line of an actual interstate sign. Blue and gray represent sky and road. Worked with members of the I-90 Aerospace Corridor to curate a collection of content, photography, quotes and statistical data to use throughout marketing collateral. Provided recommendations and direction throughout the process of building this new brand and developing a comprehensive brochure for use at various national and international trade shows.